I tweaked this recipe from an old Gourmet magazine article. I know I’ve already mentioned that I love my ice cream machine. It’s getting a lot of attention around here this summer. This is the second time I’ve made Mango Sorbet and I think I’ve got it down now. The longer you let it blend in the food processor, the smoother the consistency. Even though there’s no dairy in the recipe, it’s so creamy and refreshing (and guilt-free). If you’ve never tried making homemade sorbet, this is a perfect recipe to start with. Only 4 ingredients… no preservatives here! Make this once and I bet you won’t be buying sorbet from the grocery store anymore. Make a simple syrup by combining the sugar and water in a small saucepan. Bring to a boil and stir until the sugar is completely dissolved. Shut off the heat and let it cool down. Place in the refrigerator until completely chilled. I usually make my simple syrup the day before – then I know it’s nice and cold. If not, your sorbet won’t work. Peel all 5 mangoes. Cut the one mango into a small dice and store covered in the refrigerator until serving. Cut the other 4 mangoes into chunks. Place half the mangoes in the food processor. Pulse to break up the mangoes and add one half of the simple syrup. Run the food processor until it’s smooth. Pour into a large bowl. Repeat with the other half of the mango and simple syrup. Add that to the bowl and stir in the lime juice until properly incorporated. You can taste to see if it needs more lime juice… this will depend on how sweet your mangoes are. If you chilled your simple syrup overnight you can move on to your ice cream maker now. If you’re uncertain whether it’s cold enough, stick the mixture in the refrigerator for a few hours to be sure. Next, just pour the mixture into the machine and let it do its magic. I have the Cuisinart machine and it takes about 30 minutes. You’ll know the sorbet is done when it’s the consistency of soft ice cream. Place in a container (I use those 32oz plastic deli containers) and place in the freezer to set for a few hours. 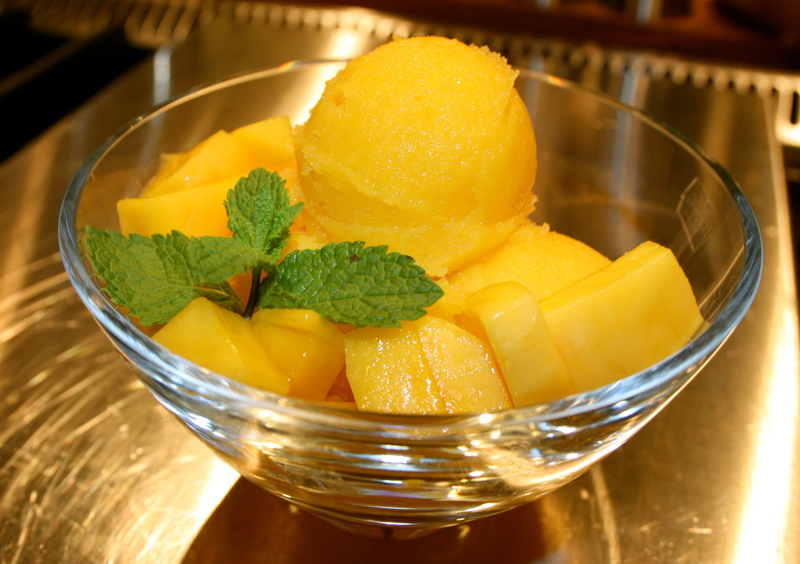 When you’re ready to serve, scoop into bowls and garnish with the diced fresh mango. Double mango and oh so good! IMPORTANT TIP: the first time I used our machine I was very impatient and didn’t let the freezer bowl of the machine freeze for long enough. It says that it will take 6-22 hours depending on your freezer. That’s a really big range of time, isn’t it? Weird. Anyway, I only froze it for 8 hours or so. It wasn’t long enough. Now I keep it in my freezer all the time, so it’s ready when needed. I would recommend keeping it in there overnight before you use it the first time. This looks delicious! I’m going to have to try it ASAP. I’ve never actually picked a mango from the market, what do I look for? Is it too late in the summer already? Good morning! Actually I think our stores here in the Northeast have mangoes all year round. What I look for is a mango that has some red and orange/yellow to it’s color. If it’s all green it’s not ripe. I give it a gentle press and it should be slightly soft. Kind of like picking a ripe avocado. This recipe is so easy, you’ll love it! Remember to make your simple syrup in advance so you can chill it completely before making the sorbet. Hope this helps – let me know if you have any other questions.